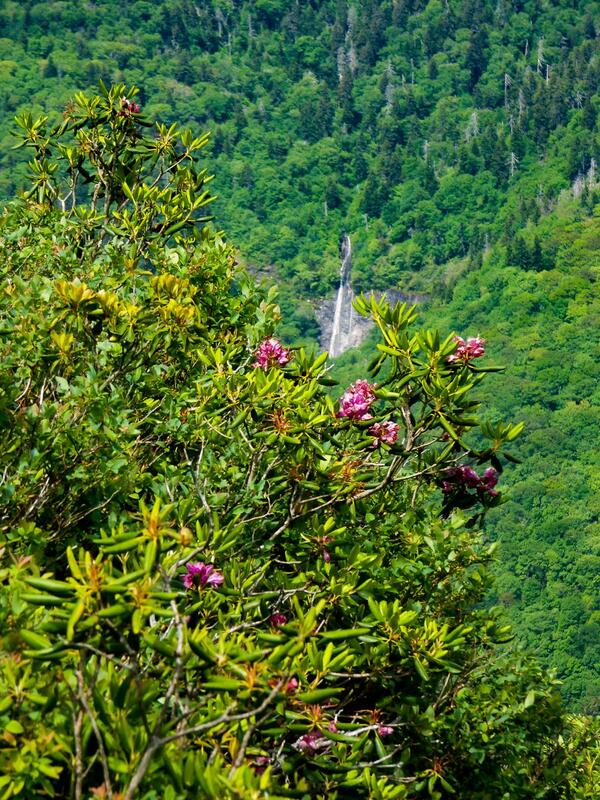 The Park Service touts this waterfall at over 800 feet high on the overlook sign. If true, this would make it one of the highest in the East. I'd say it's probably more like 200 feet high - if there is any water flowing at all when you visit. The creek is small and tends to dry up during the summer. This is a long, sliding cascade which gets steeper in the middle, then shallows out some near the bottom before disappearing behind the trees. There's no legal way to see this waterfall up-close. Visible from the Glassmine Falls overlook on the Blue Ridge Parkway at milepost 361.2, or via a 200-ft. paved path starting at this overlook. It's about 20 miles North of Asheville on the Blue Ridge Parkway. You can see the falls right from the sidewalk by the overlook, but a short walk up the 200-ft. paved path affords you a wider view of the falls and mountains across the valley.